Welcome to Sossus Dune Lodge in Sesriem Namibia for all your accommodation needs. 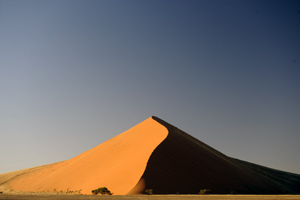 Sossus Dune Lodge in Sesriem offers quality accommodation in Sesriem Namibia for holiday travel. 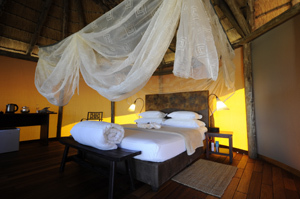 Built in an environmentally sensitive manner, primarily from wood, canvas and thatch, in an attractive 'afro-village' style, Sossus Dune Lodge will offer guests an evocative and life changing experience. Situated within the park, guests benefit from being able to reach Sossusvlei before sunrise, and to stay until after sunset, and on their return after an exhilarating day, to relax in the tranquillity and splendour of the Namib Desert, under the spectacular African sky. Accommodation is offered in 25 spacious chalets thirteen on the left of the main area, with views of the dunes, while the other 12 chalets, on the right of the main area, have a view of the mountains and the Sesriem Canyon. 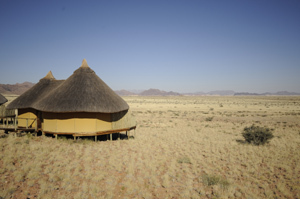 All chalets are built in an eco-friendly Afro-style manner using wooden frames, canvas for walls and topped by a thatched roof –similar in style to the the Ovambo Traditional homesteads as found in the northern parts of Namibia. • Namib by night - guided after dinner stroll and stargazing.